Marjorie and Steve Gadd, musicians, publishers, music teachers and folklorists working and performing in Southern Tasmania. Welcome to the website of Marjorie and Steve Gadd, musicians, publishers, music teachers and folklorists working and performing in Southern Tasmania. This Web site has been developed to showcase all of our various musical projects in a single site. We refer to our folkloric activity, research, performance and teaching the Tasmanian Heritage Music Project. Bands; performing listening music for every situation and dance music for community folk dances including Traditional Tasmanian country dances, Bush dances , and American Contra and Square dances. We play for weddings, community events, and all kinds of private functions. Musical mentorship and community development projects. Shake Sugaree, Bluegrass and Old-time acoustic Blues. Czardas, Gypsy and Gypsy influenced music. Silkweed, ambient musical setting for powerful political and historical narrative ballads. 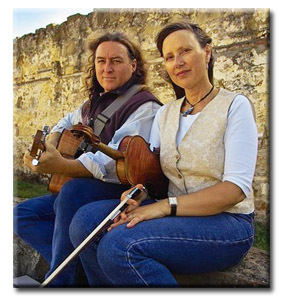 In addition Steve and Marjorie often play original nouveau-acoustic, along with jazz, Celtic, gypsy and light classical music for atmospheric background music at weddings, garden parties and conference dinners etc. Steve and Marjorie work closely with dancers and dance callers and demonstrators from the Tasmanian Folk Federation. In particular they have a close collaboration with versatile dance caller Dave Wanless. They can provide music and organise callers for Traditional Tasmanian, mainstream Australian Bush dancing, American Square Dances and Contras,Renaissance, Medieval, etc.